Finding a cleat for wide feet can feel like an enormous feat – pun intended. Many cleats are not made for wide feet for some reason, so finding any shoe for wide feet can be a huge challenge. Cleats are no exception. From wide indoor soccer shoes to wide outdoor cleats for baseball, athletic footwear seems geared toward those with narrow feet. Luckily, there are plenty of options for a variety of sports. These cleats come in many price ranges and offer plenty of features. Most of the cleats come with a mixture of natural and synthetic materials. Many of them utilize kangaroo leather for increased comfort and support. Just because you want to be a little thrifty while shoe shopping doesn’t mean you need to sacrifice comfort or support. Most customers were easily swayed to inexpensive cleats or ones with high-end features. Yet the most important factor to most shoppers was simply the fit and quality of the shoe. Did the shoe actually fit a wide foot? Could the cleat be worn for extended periods of time? Most customers who were happy with their cleat purchases could easily answer yes to both questions. Below are some of the most affordable cleats for wide feet on the market that offer a large range of features, materials and styles. Nike Men’s The Nike Premier Soccer Cleat – These leather cleats feature both kangaroo and goat leathers. The heel panels are added for comfortable flexibility and reduction of chaffing or scuffing heels. The sock liner has plenty of support and cushioning. Customers find these cleats to be some of the most comfortable they’ve ever experienced. They love the fact that they can be worn for hours on end. Some customers felt the cleat felt a little slippery in rainy conditions but that the comfort outweighed the performance issues. These cleats are available at mid to high range price point. Zephz Wide Traxx Soccer Cleat – The Zephz Wide Traxx Soccer Cleats are made of a synthetic leather with rubber studs. The studs allow for plenty of traction – including indoor traction. The outsole is made with a durable rubber that will last for seasons to come. The cleat offers a traditional lacing system that allows for a snug fit and central support. The tongue folds over for extra comfort. Customers love the fact that these cleats come in a variety of hard-to-find sizes. The biggest concern with these cleats was the small variety of color schemes offered by the company. For the mid-range price, these are some of the best cleats available. 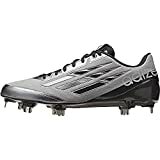 Adidas Adizero Afterburner Mens Baseball Cleat – These Adidas Adizero Afterburner cleats are made of a synthetic nubuck upper. The lightweight material also features a graphic twist. The patented SPRINTFRAME construction utilizes intense research to keep your foot balanced. The technology also offers plenty of stability and is made of lightweight materials. The patented SPRINTWEB construction on the color offers the perfect fit and locks your foot in for superior support. You’ll get the best linear and rotational traction in the waved design. The padded tongue is anchored for maximum support and is super cushiony for a comfortable fit. 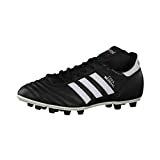 Adidas Performance Men’s Copa Mundial Soccer Shoe – The Adidas Performance Men’s Copa Mundial Soccer Shoe is made of imported leather with a rubber sole. It also features a kangaroo leather upper for breathability and added support. The outsole offers dual density comfort that has been trusted for many years. The EVA insole is comfortable and helps to cushion and support the foot. The pitch also adds extra comfort. The outsole clings to the ground to offer plenty of exterior support. It has been direct-injected for an extra firm fit. These cleats might not win the game for you, but they’ll do their best to make sure you’re at the top of your game. Adidas Men’s Gloro FG Soccer Cleat – These leather Adidas Men’s Gloro FG Soccer Cleats come with a leather upper and a rubber sole. They offer a stellar combination of modern technology with classic materials, like kangaroo leather. The EVA insole is extremely lightweight. Customers love that the cleats help to distribute the players weight evenly across the shoe. The flexible sole is so comfortable most players claim it feels more like soft leather than rubber. Yet some players complain about the length of the laces as they are a little too short. Buyer’s Guide – What Are The Best Soccer Cleats For Wide Feet? Customers should consider the following factors when considering athletic boots for wide feet: Price, size, type, quality and comfort. The type of cleat you choose will widely depend upon your activity. There are cleats available for several sports, including soccer, baseball and football. You should choose the appropriate cleat for the appropriate sport. Most soccer cleats come with low ankles for more flexibility during running while other types of cleats offer high ankles to support the joints of the foot. The size of the cleat is also extremely important. Finding the right fit might mean that you need a wide or narrow shoe size. Always double check consumer reviews to determine if a cleat runs large or small. You should always pay attention to the quality and comfort of the materials. If your shoes aren’t made of quality materials that combine new technology and time-tested materials, you should consider another shoe. Check user reviews to determine if the cleats are comfortable enough for a wide foot. Finally, price should always be a consideration when purchasing a cleat. Cleats come in a variety of price points, yet you should never assume that the most expensive cleat will offer the most comfortable fit or quality materials. Try to find a cleat that offers the most bang for your buck, and you’ll feel your money has been well invested. This entry was posted on February 3, 2016 by admin.